Thank you for all the feedback on my new site. I’m so glad you love it!! 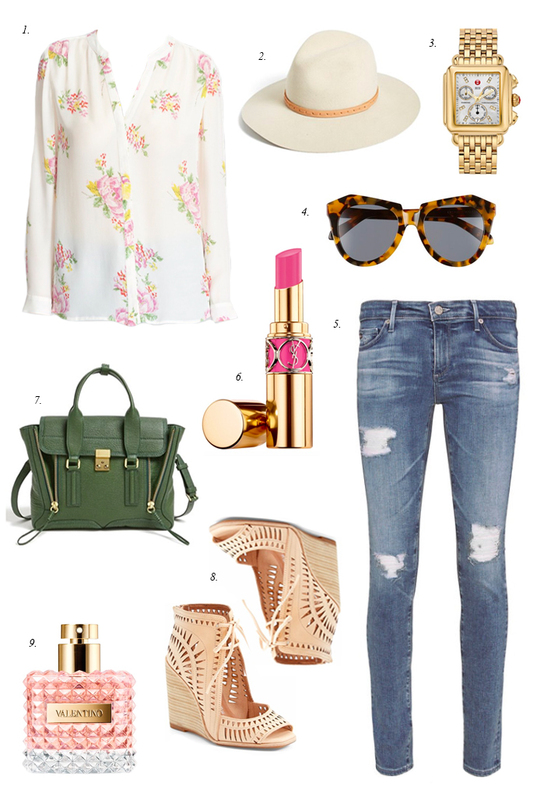 Here’s some spring outfit inspiration for your Wednesday morning! So nice things… Love this shoes. The new site isn’t loading on blog lovin’s app FYI. Thank you for the heads up Laura!! Fashion Question: I need to purchase a pair of black pumps – When do you wear a)leather, b) suede, and c) patent leather?? Which material would I get the most use out of, if I can only choose one?? I probably wear patent leather the most! I especially love the Christian Louboutin So Kate black patent leather pumps :) Those would be my #1 choice!! Hope this helps! I am loving that blouse, Jeffrey Campbell wedges, and distressed jeans! Love those Jeffrey Campbell wedges! They are on my shopping list for spring/summer. Love this whole look…that bag is the prettiest shade of green!! Love that olive green bag! I absolutely adore the floral top and the pink lipstick! Perfect for Summer time! Love all those pastel colors and feminine shades! Those wedges are perfection! Great picks, Rach! It is a lovely update but unfortunately links don’t work in my blog reader feed anymore – I use Feedly and not have to click over if I want to see what you’ve linked to (like the gorgeous Joie blouse!). Oh no! The links aren’t working for you? They are for me… maybe refresh your page? Hope they get working soon for you! I love the new website. I was really looking forward to the home-decor section. We have very similar taste on interior design. Even though I have seen lots of pictures of your kitchen I would love to see it in more details, like the living room reveal or Isla’s nursery. You might as well do a house tour lol why not? Also I love how you separated the outfits it makes it so much easier to look for inspiration. Good job Rach. You know what I was thinking? maybe you should do a section styling Drew. I mean wouldn’t that be great? my husband and I are almost the same age as you and Drew. He sometimes asks me for help and to be honest, mens clothing is a whole new world. what do you think? Thanks Mariana! And thanks for the suggestions of showing more home decor. And maybe I’ll see what Drew thinks of doing a styling section :) haha Have a great day! Love the look of your new site! Just wanted to say congratulations on your little one on the way. I’m expecting baby number too as well, and I’m guessing I’m just a few weeks behind you. I was wondering if you change up your makeup or skin care routine during pregnancy, as I know there are some things we’re supposed to stay away from during pregnancy. I’ve been nervous about about wearing makeup, but I see so many people do and it’s totally safe. Best to you and your beautiful family! Congratulations on baby #2!! That is so exciting :) I pretty much keep my skin care routine the same during pregnancy, at least I have so far in this pregnancy. I know every woman and every pregnancy is different, so I suggest just figuring out what works for you and your skin! Love your picks! Super cute! I’m in love with that green Phillip Lim bag!